Rockin’ Green Laundry Detergent Giveaway ~ 3 Winners! Welcome to the Accessorize Event! I wanted to chat today about something that all families could use – not just cloth diapering mamas, though we do have to think about it more since there are only certain laundry detergents that we can use with our diapers. Rockin’ Green Laundry Detergent is is an award-winning manufacturer of eco-friendly cleaning products designed to make cleaning easier and greener. No fillers, No enzymes or optical brighteners, 100% Phosphate free, Vegan. If you have not known where to start when it comes to a natural detergent then start here…What formula is right for me? There are 3 different formulas for you to choose from. It will depend on what type of water you have – hard, normal, or soft – to determine which may be the best for you….Hard Rock, Classic Rock, or Soft Rock. Then you can decide which scent sounds the best – choose from 5 yummy ones. Smashing Watermelons, Earth, Wind, & Orchids, Rage Against the Raspberry, Motley Clean, & Lavender Mint Revival. They all smell awesome and are made with natural fragrance oils. Or the unscented variety…Bare Naked Babies. Still not sure what you really want? Try a Sample Bag for $.85 – will get you 2 or 4 loads depending on your machine type. If you cloth diaper then you will definitely want to Rock a Soak as your first load. Get the stinkies and build up out! 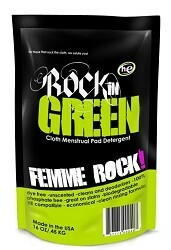 I recently received the Femme Rock detergent which is aimed for cloth menstrual pads. Yes they have their own detergent too! This enzyme based detergent is designed to work on the toughest of stains while keeping your reusable cloth pads looking like new. It will work with ANY load that you use Hot Water with. Keep your cloth looking fresh and help them to last even longer! oh, and don’t forget to check out Dog House Rock for your four legged friends! What formula and scent will you start with at Rockin’ Green? Win the bag of your choice! Be sure to visit all these Awesome Blogs and see their Cloth Diaper Accessory Stash Giveaways!! According to Jenny, So Easy Being Green, and the Accessorize your Stash participating bloggers are not responsible for sponsors who do not fulfill prize obligations. I received this product for review. All opinions are my own. This giveaway will end on Aug 31, 2012 at midnight EST. Winners will be drawn via rafflecopter. Once a winner is drawn I will contact them and they will have 48 hours to reply before I draw a new winner. Giveaway is open to anyone in the US/Canada and you must be 18 years of age or older. Giveaway not affiliated with Facebook & I release them of liability. Winner will be posted in the rafflecopter widget. I have tried Rockin Green and I love it! We try to go all natural in our home! We love Rockin' Green in our house - I use it on our regular laundry! I currently use Rockin Green. Could use more! not exactly natural, but I am using laundry detergent I make myself. I use RnG for my day to day laundry. The Classic formula seems to work well for us. I have used it before, and would love to use it again. Thank you for the giveaway. Currently using soap balls, but would love to try a new product as they'll need to be replaced soon. I'd love to try the raspberry 'classic rock!' Love all the names!! Currently use and love Rockin Green! I have not used their products before, but I have heard of them-my sister has used it! I have been migrating over eco friendly and all natural for awhile now. I would love to try this detergent! I am on my last bag of Rockin Green and I lOVE it! I sometimes make my own detergent, or use the Kirkland brand from Costco. No, I've never tried this before! I have used it before in the past. I love the Motley clean one! This is a great giveaway! I have not tried this detergent before, but I have heard so many great things from other customers. I am currently using Charlie's soap which is wonderful, but I am looking to switch things up every now and again with a scented detergent. I have not tried the rockin' green brand before, but I would really love to... I have not used eco-friendly laundry soap before, but I want to start!! We have tried Rockin Green and really like it for our cloth diapers! I've tried RnG before and we're still using it now... shhh I used it in my dishwasher today and it was awesome. no, I haven't tried it before but my sister loves it! I have never tries, but, I sure am willing to change!! Yes, I'm currently using Rockin' Green, and I love how it cleans! The Classic Rock one is working for me so far! I haven't tried this but heard it's good for cloth diapers. Haven't tried it yet. Can't wait to try it! We are about half way through our bag of hard rock. It has been working great o far. We have the unscented and would like to try one of their scented kinds. I've never tried it, but would love to. I'm wanting to use more 'green' products. I haven't tried it before and currently I am not using an Eco-Friendly laundry detergent that I know of! I know that's a terrible thing to admit, but I am definitely going to start using it!! I've never tried it, but would love to. Thank you! I have not yet tried Rockin Green before but would love to. I use a detergent that is supposed to be good for the environment but I would like to see how well this one works as well. I use Rockin' Green regularly. I'd love to win a bag for my sis! I haven't tried Rockin Green. Currently using Tide. I've used Rockin Green and Funk Rock. I actually have tried Rockin Green before and I really liked it. I have never tried Rocking Green - currently using Green Works! i have never tried rockin green. i currently use either purex hypoallergenic or just baking soda and vinegar. I haven't got to try it yet! Right now I'm using Purex liquid because I had coupons for it! :) Thanks for the giveaway! I have never used. I try to use Enviro friendly but sometimes they are just too expensive. I've used Rockin' Green before. I'm currently using Lulu's on the diapers and I'm using Trader Joe's on my regular laundry. I'm haven't used this detergent yet- but can't wait to try it. no, I haven't had a lot of luck trying eco-friendly but again- I really, really want to go that route . I just recently switched to Rockin Green and love it! Yep I use it and not for CDs! LOL I use it for the few trainers dd still uses, mama cloth and dd's regular clothes. I've been trying to use eco-friendly detergent for all our laundry and for the most part have been successful. I have never tried Rockin' Green but have heard such wonderful things about it that I would like to. I am currently using Charlie's. I haven't seen this detergent for sale, fo I haven't tried it, yet. I love using eco-friendly detergents. I have tried rockin green and it's great, currently using ecos for everything. i have, but its been a while and with a diff washer. would love to try it again! I have never tried it yet but have heard great things! I just started using cloth diapers and I need to find a good CD friendly detergent before I add something more than flats to my stash. I have tried and loved Rockin' Green before. Usually we use All Free and Clear or whatever other fragrance-free brand is on sale, but I prefer Rockin' Green or other smaller, more eco brands, especially when we are washing diapers. I have tried samples before and I love it! Right now I am using Tropical Traditions laundry powder which I love! I have not tried Rockin Green yet but I am using a eco friendly laundry detergent! I tried RNG, but actually prefer Tide on my cloth diapers. I did like using it for cleaning though. I have not tried Rockin Green yet, but would like to. I am using a low sudsing detergent right now. I have not tried it before. My daughter would like to use it with cloth diapers for her new baby. I have never used Rockin-Green products before. Love Rockin' Green! Getting geared up to start using it again for the new little guy when he arrives. For our clothes, we use Method and RNG for pee undies and dipes. We have not tried it yet, but would love to. I have never used rockin green, but we do use an eco friendly detergent. 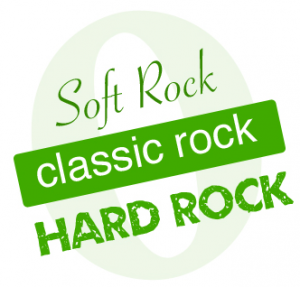 I have used Rockin Green before, I love the Hard Rock formula! I have used it on my sons cloth diapers and clothes - it's great for his sensitive skin! 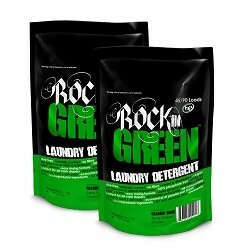 I just purchased my first bag of Rockin' Green but haven't gotten to use it yet because my washer broke! I have not tried an Eco friendly detergent before. I'm going to cloth diaper my new baby girl and will need some detergent! I have never tried it but I have been making my own detergent at home for five years or more. I'd love to try a "green" laundry detergent. I've been using regular brands that's "free" of fragrance... and luckily babygirl hasn't had any allergy reactions to it. I have used Rocking Green. I have the Femme Rock for my mama cloth. And we used to use Classic rock for our diapers but it's hard to find in Canadian stores! I have tried the unscented Rockin' Green detergent - and it's great for our cloth diapers. I use Rockin Green on my cloth diapers! I love Rockin' Green for my daughter's cloth diapers, but it is too expensive to try on our regular clothes (I use a homemade soap for that). I have never tried Rockin Green. i am not using an eco friendly detergent. i buy whats cheap! just finished a bag of rockin' green and now my babe is toilet traied, but i just ordered some mama cloth, so i'd love to try the femme rock! ive tried a few samples and just moved to a place that seems to have different water// i think harderso my current homemade detergent doest work as well! I love my Rockin Green! It's all I use, and I use it on all of my laundry not just diapers! I would like to try Rockin Green Detergent and I always buy eco friendly detergent. I love rockin green! I have found the soft rock to work best for me and my water! ohh i need this so bad thank you for the giveaway!!! I have used Rockin Green before and I like it. Now I make my own detergent and it is eco friendly. I use ECOS free and clear but I LOVE Rockin Green! I've never tried Rockin' Green, but I can't wait to. I've had Crunchy Clean and Tiny Bubbles for my cloth diapers, but never found anything I'm really crazy about. Hoping Rockin' Green is the one! Just tried it and I love it! I lov Rockin Green! Switched to Tiny Bubbles and hated it...going back to rockin green! I've never tried Rockin Green before, I make my own detergent. But I'm starting to use mama cloth and wonder if I should switch. I can't wait to start using this stuff! Going to cloth diaper with my first and got me some Rockin Green to start! I haven't tried it before, and I'm not currently using an eco-friendly detergent. I have in the past, but they're often so expensive! Use it and love it. We also had to give the Funk Rock a try since we started to battle with really stinky ammonia problems. True to it's word...it kicked out the ammonia stink and hasn't returned yet! I have not used them before and I do use eco friendly laundry detergent. yes, i love rockin green. Haven't tried it, but I would love to! We use RNG hard rock & love it! I have used Rockin' Green before, the sample sizes, and I loved them! I just wish the full size ones weren't so expensive! i haven't tried rockin green yet but would love to!! i'm a bit bummed they don't make mighty mighty marshmallow scent anymore though- that's the one i've really been wanting ti try! :( we use country save cloth diaper friendly & eco happy detergent right now! thanks! Have not tried it before but I prefer eco friendly. I have tried a sample of rage against the raspberry! Loved it and would love to try more! I have not tried it before but I have heard good things about it. I love the idea of it being environmentally friendly too!! Haven't tried it but I've heard alot of good things about it. I haven’t, but I’d love to and I am not currently using an eco-friendly detergent. We've used Rockin Green before and really need to get some more! I have tried RNG in Bare Naked Babies Hard Rock. But I think the classic rock might work better. Plus I've gotta try one of the yummy scents! I have not tried Rockin' green detergent, but would love to try it to compare to my current detergent. I haven't tried the Rockin detergent but would like to. I really want to try Rock in Green! The local store that carries it has been out for over a month now but they are going to contact me when it comes in. I tried ordering some from an retailer and got sent the wrong formula! Luck is not with me and RinG! I have not tried it yet but really want to! Thanks for the great giveaway! I haven't tried Rockin' Green yet, but I would like to. I did use eco-friendly detergent that I special ordered when I was washing diapers daily. i have tried RnG. that's what i'm using for my diapers right now. Haven't tried any yet,, but would love to! I've never tried this detergent and yes, I use Method laundry detergent which is eco-friendly and works great! I currently use 7t Generation, but would love to try this. Thanks for the giveaway. I tried a sample, but would love to win a bag to really try it out. I have not tried Rockin Green yet. I used Rockin Green and I liked it but we're on a squeaky tight budget so I switched to Country Save. It is still eco-friendly but less expensive. It's not as good with my hard water so I would love to win this prize! i currently use rockin green! I LOVE Rockin' Green! It's my favorite detergent, I've tried a few and haven't liked them as much as RG! I have not tried Rockin Green before. I have used Rockin' Green before and LOVE IT! I have not tried Rockin Green yet but I use Nellies in the tin. Haven't tried Rockin' Green before, but am currently using an ecofriendly detergent that I bought with a gift card I won. I have tried it in their raspberry scent and LOVED it! I only use eco-friendly cleaners for my whole house. I will be cloth diapering and look forward to trying Rockin' Green for hard water!! I'm all about Rockin Green. It's the foundation of my cloth diaper care routine. We have hard water and I'm hoping Rockin Green will help our laundry with this! I *want* to use a more eco-friendly detergent. I have used samples of Rocking Green with my daughter's cloth diapers and I really like it but haven't purchased it yet. I would like to try it before I use it. I still use Tide detergent. I guess I need to be persuaded. Never tried it. I am not currently using an eco friendly laundry detergent.